Successful ex-offenders are employed ex-offenders. The top indicator of a future free from incarceration for an ex-offender transitioning back into society is employment. But most employers will not hire ex-offenders. This reality forms the foundation for the Belay Enterprise mission of partnering with the church to create businesses that employ and job train individuals rebuilding lives from prison. Over the past 16 years, Belay has incubated four projects that have hired hundreds of individuals. Last year alone, our businesses employed 75 people rebuilding lives. At different points over the years, we have set various goals of incubating x number of businesses in the future. But we realize more and more that this is not enough. If we are going to positively impact recidivism rates in Colorado through employment, we have to think bigger than ourselves. Over the next 5 years, Belay Enterprises is aiming to create 750 employment and job training positions a year. By focusing on the total number of annual jobs created instead of the incubation of individual businesses, we hope to move from an internally-focused program into an organization that inspires Christ-following businesspeople to create opportunity for ex-offenders. There are many talented entrepreneurs sitting on the sidelines of our churches that if engaged towards these goals could make a much bigger impact on ex-offender employment than Belay by itself. Tomorrow, Belay is hosting a Faithventure forum for a group of 12 business and ministry leaders in the community with a desire to create opportunities for ex-offenders. This is one of the first steps in the development of a faith venture fund over the next few years. 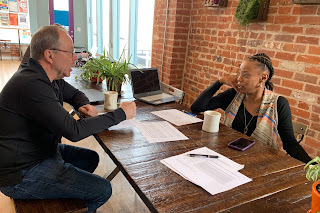 We plan to connect Denver area Christian entrepreneurs that desire to start businesses for ex-offenders with start-up funding as well as technical assistance. By recruiting experienced business leaders to work alongside Belay to identify, launch and provide mentor support of promising new ventures, we will be able to make progress towards the goal of 750 annual jobs for individuals rebuilding lives in 5 years.